Dartmouth men’s basketball managed to come away with its first Ivy League victory of the season Saturday after beating a struggling Princeton University team that has now lost four straight games. The Big Green is currently 1-7 in league play and last in the conference. Columbia University, Cornell University and Princeton all hold records of 3-5 and are tied for third. The University of Pennsylvania and Harvard University are tied for the top spot at 7-1. While Yale University and Brown University sit at 4-4 and tied for second place. The race for spots in the Ivy League Tournament is looking closer and closer, and any of the five teams that are currently in the middle of the pack at 4-4 or 3-5 can feasibly take the three and four seeds in the tournament. Remember how I said last week that Princeton was a lock for the tournament barring a total collapse? It looks like that collapse is happening. Meanwhile, the race for the Ivy League Tournament on the women’s side is looking just as, if not more, intense. The Ivy League women’s basketball tournament follows the same structure as the men’s where the top four teams get in based on conference record, with head to head matchups used as tiebreakers. There are currently five teams with close conference records. Penn and Princeton are both atop the standings at 6-1, Harvard and Yale are both one and a half games back at 5-3 and Dartmouth is 4-4. The remaining three teams in the Ivy League have some work to do if they want to catch up. Brown and Cornell sit at 2-6, while Columbia is 1-7 in conference play. Let’s see if the numbers tell us anything about which teams have the best shot at making the women’s tournament. Let’s start with the current leader. As I said in my previous column, if Penn makes the Ivy League Tournament this season, the Quakers will have a very good shot of winning the whole thing due to home field advantage. Last year, Penn won the Ivy League Championship and the Ivy League Tournament, gaining an automatic spot in the NCAA Tournament, where the Quakers lost to Texas A&M University by two points. A year ago, Penn was clearly the best team in the Ivy League, but now Penn is currently tied atop the standings with Harvard. Penn’s strength this season comes from its defense. Through 20 games, Penn’s defense has held its opponents to a field goal percentage of .362, best in the Ivy League. Penn’s defense also forces its opponents to shoot the ball more so than other teams in the Ivy League. Penn’s defensive free throw rate, that is, free throws attempted per field goals attempted, is 21.8 percent, second lowest in the Ivy League ahead of Dartmouth. Couple a low free throw rate with a low defensive field goal percentage, opposing teams are going to have trouble scoring on your team’s defense. Penn’s defense is anchored by senior and 2017 Ivy League Player of the Year, Michelle Nwokedi, who is currently third in the Ivy League in blocked shots per game behind Brown’s Janie White and Princeton’s Bella Alarie. The Big Green is certainly knocking on the door of the Ivy League Tournament. At the moment, the Big Green is the best shooting team in the Ivy League, sporting a field goal percentage of .430. Dartmouth has the playmakers too. Kate Letkewicz ’18 is the fourth-best three-point shooter in the Ivy League with an average of 2.5 three-point shots per game, and Cy Lippold ’19 leads the Ivy League in assists, with 114 through 21 games. However, if the Big Green wants to make the tournament, there are a few of the “Four Factors” at which Dartmouth is seriously lagging behind the rest of the Ivy League and that the team needs to improve upon. Dartmouth turns the ball over on offense more than six of the seven other teams in the Ivy League, averaging 17.8 turnovers per game, but more glaringly obvious is Dartmouth’s inability to get to the free throw line. The remaining seven teams in the Ivy League all have offensive free throw rates between 20.6 percent and 28.7 percent; Dartmouth’s free throw rate is 15.6 percent, a good five percentage points below Penn, the team right above it. Curiously, Dartmouth’s defensive free throw rate is also quite low. At 18.5 percent, it’s the best in the Ivy League, and three percentage points below the next ranked team. It’s interesting how Dartmouth struggles to get to the free-throw line and excels at keeping its opponents from getting to the free-throw line, but if Dartmouth wants to improve, having the ability to take a few more free throws wouldn’t hurt. Dartmouth is the third-best free-throw shooting team in the Ivy League, so a few more opportunities at the line would serve Dartmouth well. As the Big Green currently sits tied for fourth place, Dartmouth has to immediately compete with Harvard and Yale for a spot in the Ivy League Tournament. Yale’s strength is forcing turnovers on defense and the Bulldogs force the most turnovers per game on defense in the Ivy League. Harvard’s Katie Benzan is the best three-point shooter in the Ivy League, shooting .473 from the three, five percentage points better than Dartmouth’s Lippold. Dartmouth can compete in this league this season, but the team is on the outside looking in right now. 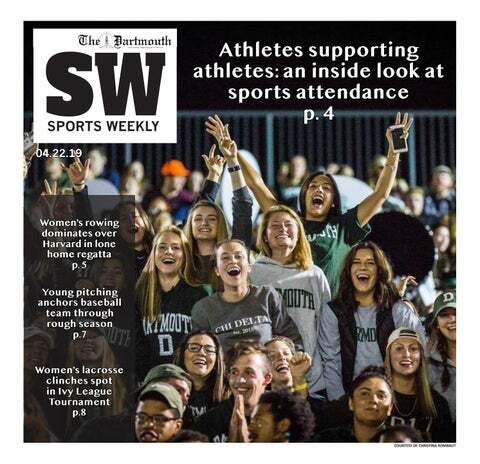 With a little bit of improvement, Dartmouth can certainly overtake Harvard or Yale for a spot. Maybe if I mention Princeton being a lock for the tournament barring a total collapse again as I did for the men, Dartmouth may have a better shot.